Modern dance pioneer and guru, Martha Graham, graced our stage a few times through the 1940s and into the 1970s. This flier is from 1942, when you could see her performing in Punch and Judy for 55 CENTS! 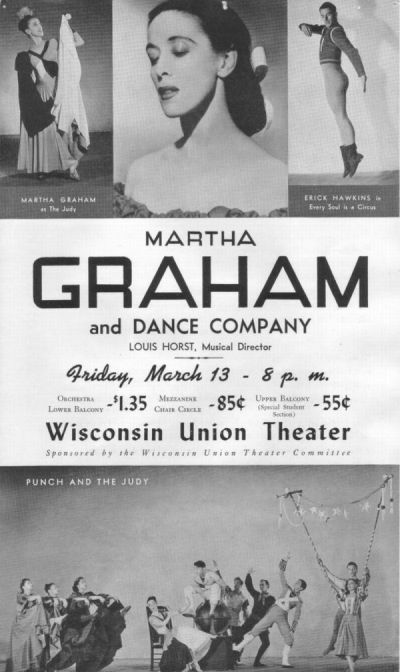 Fun fact: The Martha Graham Dance Company is the oldest dance company in America and continues to perform today . Another fun fact: The Union Theater continues to bring some of the most innovative artists (but you already knew that one, didn't you).